Yay! Glymm has finally opened up the subscriptions for the Glymm MAN box (the male version of the Glymm box that is made for the ladies). It took a while but at long last, the subscription box mailing for guys begins! 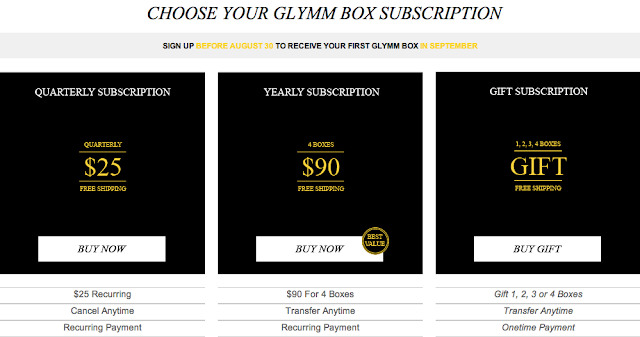 As stated in a previous post (Glymm for Men aka GlymmMAN), the difference between the the Glymm subscription and the Glymm MAN subscription says it all in the name itself. The Glymm MAN box is the male version of the Glymm box. The grooming categories span to include fragrance, skincare, shaving and lifestyle products within the Glymm MAN box, with the products being different and selected according to a lifestyle profile that the subscriber completes at sign up. 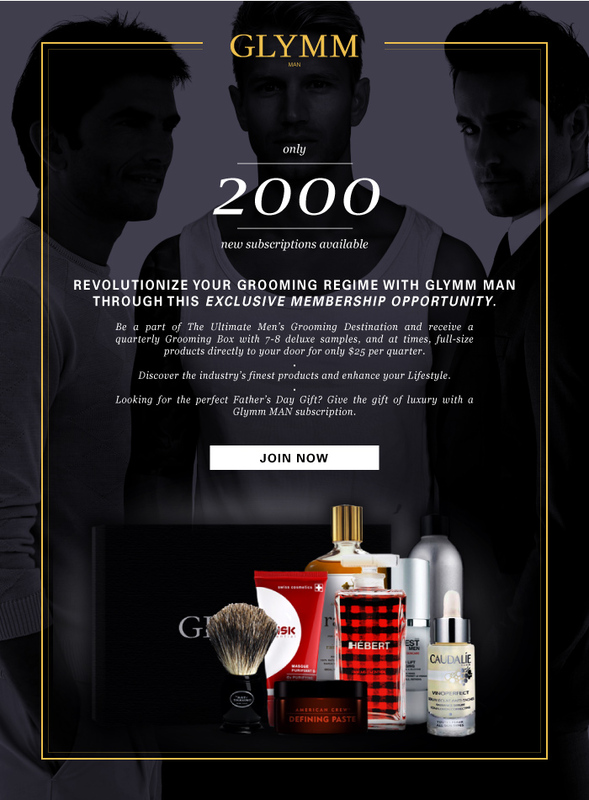 While the female Glymm box offers 4-5 deluxe beauty samples delivered monthly to the doorstep ($12/month), Glymm MAN is a grooming box containing 7-8 deluxe samples, and sometimes, full-size products that is mailed out quarterly ($25/quarter). Of course, if you subscribe for a longer period of time instead of going month to month, there is a slight discount in price. While I had originally joined the GlymmMAN waitlist and have been waiting quite patiently, it seems that maybe the subscription had opened up once before to join. From what I've read, it seems like those who had subscribed already should expect to receive their Glymm MAN box in June. This is a bit disappointing to hear since I had not received any notification previous to the email I received today in regards to being able to join. Maybe the first time around they didn't email but only posted it on Facebook or Twitter? Not too sure since I was not able to find out any information about it other then some people wanting confirmation from Glymm whether the box will be mailed in June. If it was open and only announced through Facebook or Twitter, that frustrates me so. I'm getting a bit annoyed that everything is reliant on these two social media networks. Truthfully, i'm not the type to constantly use and check them. As well, I don't like the idea of being forced to use them. It makes me feel frustrated for people who either don't have or don't like using these social media so that they have no opportunity partake on certain promotions, contests or events. Sorry for my digression and little rant but these Facebook/Twitter exclusives is happening way too much in my opinion. Of course, upon receiving the email, I jumped at the chance to sign up for Connor. I felt bad that I kept receiving all these boxes in the mail while he got zilch. I had to debate with myself a bit in regards to which subscription I wanted to sign up for. The yearly subscription does give a $10 discount which isn't much, but still something. As well, Connor doesn't care to much for looks and taking too much time for maintenance so I'm not sure how well the box would work out for him since I couldn't find any example of a subscription box yet. I bit the bullet though and just signed up for the year since I like receiving these boxes, so if Conner doesn't want it, i'll take it! The only strange thing is that when I registered for an account on the Glymm Man website and received their welcome email, it did state that to become a Glymm MAN subscriber, it was just for $20/quarter. This actually coincides with the $20 price that the original Glymm MAN information provided. I'm not sure why it's $25/quarter now because that is what I was charged for, unless Glymm just forgot to update the price in their correspondence. Now, it is just a waiting game where i'll have to wait until September before I can review this new Glymm MAN subscription with you! WHAT THE HECK!! The first box is in SEPTEMBER!?!? I signed up and paid the $20 and it said they were going to send on out in June just in time for Father's day! Ooooh....When did you sign up? Was it before this June 7th subscription opening? Like I said, I did see some people asking about the June delivery dates and that's why I assumed there was another previous subscription signup that I missed out on. Maybe you did sign up earlier and you'll still get it in June because when I signed up I had to pay the $25 price they have listed right now. Ahh that makes more sense. I found out that mY dad is getting the June box and I did pay the early bird price. He got his shipping notice, so we'll find out what he'll get. Have you heard of Mantry? It was featured on blogTO, they feature lifestyle items for men. Maybe Connor might like this too! Lucky! When was the early bird sign up available? Booo....Oh well, I hope you get a chance to post it! So does your dad know he's getting one or is it a surprise? Yeah I've been seeing guy version subscriptions in articles and such, Mantra sounds cool but i dunno since it's food and such... Did you subscribe or are you planning to?